English author and technologist; born at Hull 1828; died at London March 9, 1878. Going early to London, he attended the School of Design and the School of Art at South Kensington, and was one of the first art-teachers sent into the provinces by the Science and Art Department. For several years he was connected with the college at Chester. In 1866 Davidson was appointed principal art-master of the City Middle Class School, a position which he subsequently resigned in order to devote himself more completely to the production of a series of educational works especially devoted to technical training, in which he may be regarded as a pioneer. He was well known as a successful art-lecturer, having acquired great facility in speech and considerable skill with his pencil. 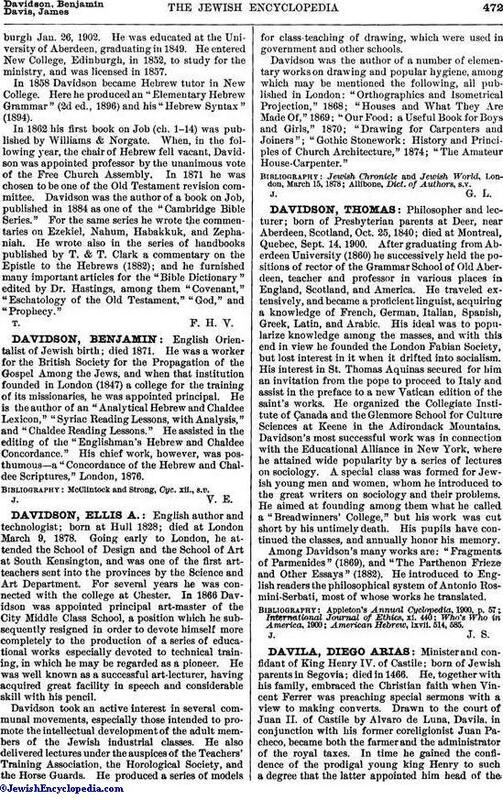 Davidson took an active interest in several communal movements, especially those intended to promote the intellectual development of the adult members of the Jewish industrial classes. He also delivered lectures under the auspices of the Teachers' Training Association, the Horological Society, and the Horse Guards. He produced a series of models for class-teaching of drawing, which were used in government and other schools. Davidson was the author of a number of elementary works on drawing and popular hygiene, among which may be mentioned the following, all published in London: "Orthographics and Isometrical Projection," 1868; "Houses and What They Are Made Of,"1869; "Our Food: a Useful Book for Boys and Girls," 1870; "Drawing for Carpenters and Joiners"; "Gothic Stonework: History and Principles of Church Architecture," 1874; "The Amateur House-Carpenter." Allibone, Dict. of Authors, s.v.